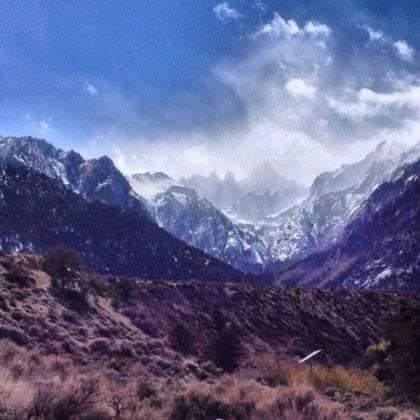 Meeting great friends to climb rocks in the Alabama Hills while the tallest peak in these Lower 48 towers above us all. To the east, desert bluffs rise in multiple shades of red and brown, starch and hot in the midday sun. These are the Inyo Mountains, a beautiful reflection of the valley floor below, almost completely devoid of trees. Directly west lie the Sierra Nevadas, 14,000′ monsters clad in snow, a direct contrast to the Inyos, they are grey and white, towering higher and considerably more alpine and ominous in nature. The star of the show here is Mt. Whitney, at some 14,500 feet above sea level, she is the tallest point in the Contiguous US. Her peak stands snow blowing and holding back the clouds regularly each morning. As the sun falls away each night, it just misses her top as it sets into the mountains of California on its daily dip into the Pacific Ocean, a body of water we’ve spent considerable time adjacent to for so much of this winter but which now seems a lifetime away. Our particular clan–two baby boys learning to walk and climb the massive boulders of the Alabama Hills that litter the western edge of this Owens Valley, their older brother now quite capable of rock climbing, the Lady, dear Nanny and myself–have been in awe of them since arriving nearly a week ago. But as powerful this scenery we’re currently calling home provides, it’s not even the best part of our time here. Our friends, and though we’ve only met now three times I do feel that the term friend is as appropriate as ever, the Mali Mish crew have been the highlight of our time. Dan and Marlene, who we interviewed around this time last year for the magazine, spearhead this traveling family who make an Airstream their home as they travel the continent. Along with them are there three beautiful children. Ava, the oldest, is bashful with strangers but as bold as any young boy when it comes to climbing rocks or hiking through snow covered Sequoias (as we were fortunate enough to buddy around with them last week in that National Park). Mila, the middle, follows the older kids around on their adventures, unafraid to chit chat with us between hopping the same big rocks but in an adorable princess gown. And then there’s Luka, the baby, the lone boy of their young ones, who despite having chickenpox was a smiling bundle of absolute adorable toddler hope and happiness. He rarely fusses, and seems as happy to run free as to be held in a pack on his mother’s back. Conversation comes easily and the kids cover more ground than we can keep track of. We talk Airstreams, pimping out vans and the general state of full-time travel. They’re boondockers, meaning they largely live off the grid, powered by solar panels, generators and the sheer determination to live directly in the beautiful places they travel instead of merely at the closest RV park. They spark that same desire in me, and the Lady and I discuss future plans and how we can get our own vintage (read, less self-sustainable) setup into a similar position. We eat Mexican food one night and talk on and over everything from traveling to Alaska to working remotely. We’re headed to Utah by way of Death Valley tomorrow, they’ll remain here, but parting is not sad. “See you on the road,” Marlene says nonchalantly as we all pass out hugs and load into our respective vans. And I’m sure we will. These mountains are as good looking to me as the Tetons, as Mt. Rainier and the Colorado Rockies. As they’ll disappear into our rearview tomorrow it won’t be bittersweet though, as the promise of Death Valley, the five parks in Southern Utah, and Colorado are all on the menu for what remains of a just now blooming spring.